The improvements to Warmley Forest Park include a 348 metre path suitable for wheelchair users and those with other special mobility needs, as well as facilities for cyclists at Warmley station to help those visiting via the nearby Bristol to Bath Railway path. The work was carried out by South Gloucestershire Council following an award by the Cory Environmental Trust in Britain in 2011, and with the participation of the South Gloucestershire Disability Action Group. Other improvements carried out during the project included work to make the adjacent car park more accessible to service users with mobility and other special needs. Welcoming the improvement works, Chair of South Gloucestershire Council’s Communities Committee Cllr Claire Young said: “Warmley Forest Park is an excellent example of the green spaces that make South Gloucestershire such a great place to live and work. “Thanks to the kind support of Cory Environmental Trust in Britain it is also now more accessible to all members of the community. Angela Haymonds, Trust Secretary for Cory Environmental Trust in Britain, said: “The Trust was pleased to support this worthy project, which has delivered considerable improvements to the accessibility of Warmley Forest Park. Warmley Forest Park forms part of the Forest of Avon and is owned by South Gloucestershire Council. The park is a mixture of young broadleaved woodland and open spaces, and is located to the east of Warmley village centre. 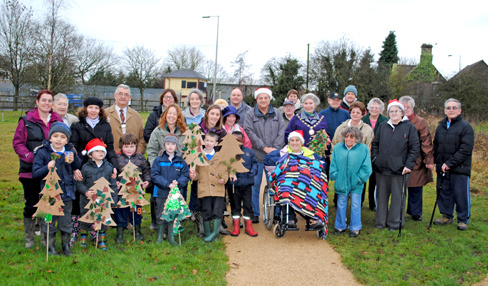 Council Chair Cllr Janet Biggin was joined by South Gloucestershire Disability Action Group and school children from Warmley Park School to celebrate with those involved in the project.